Build a court that is 12 X 24 yards (2 12 yard squares). Assign a team of 3 players to each of the 12X12 grid. The size of your court will depend on the number of players and can be made larger or smaller depending on the number of players playing and their age. To begin the game, instruct the serving team to have one person start serving the ball from behind the back line. 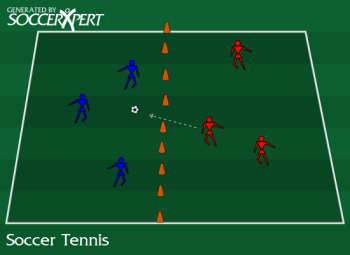 The server must volley or half volley the ball to their opponents side of the court. The receiving team has one bounce and two touches to receive the ball and play it back to their opponent’s side of the court. However, the ball doesn’t have to bounce, and the ball can be played in 1 touch. If the ball touches the ground twice or is knocked out of the playing court, a point is awarded to the serving team. Keep score just as you would in tennis.